The Evenks (an aa spelled Ewenki or Evenki) (autonym: Эвэнкил Evenkil; Roushie: Эвенки Evenki; Cheenese: 鄂温克族 Èwēnkè Zú; umwhile kent as Tungus or Tunguz; Mongolian: Хамниган‎ Khamnigan) are a Tungusic fowk o Northren Asie. In Roushie, the Evenks are recognised as ane o the Indigenous fowks o the Roushie North, wi a population o 35,527 (2002 Census). Accordin tae the 2010 census, thare war 37,843 Evenks in Roushie. 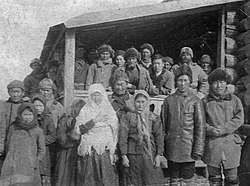 In Cheenae, the Evenki form ane o the 56 ethnic groups offeecially recognised bi the Fowkrepublic o Cheenae, wi a population o 30,875, as per the 2010 Census. Thare are an aa 535 Mongolised Evenki in Mongolie, referred tae as Khamnigan. ↑ "About number and composition population of Ukraine by data All-Ukrainian census of the population 2001". Ukraine Census 2001. State Statistics Committee of Ukraine. Archived frae the oreeginal on 17 December 2011. Retrieved 17 January 2012. This page wis last eeditit on 30 Julie 2017, at 15:10.